Stainless steel monogrammed cufflinks make a great accent with a personalized touch. Wear a piece of fermenting history, made from reclaimed wine barrels. are the base of these cufflinks plastic or steel? BEST ANSWER: The Personalized Reclaimed Wine Barrel Cufflinks are all steel. The reclaimed wood sits in an all in one piece of steel. I am ordering for my husband, do I use his first initial or last? BEST ANSWER: I ordered them as a gift and used the last initial. I think of them like a monogrram and that's usually the last initial. My friend liked them a lot. But, be prepared, they aren't as big as I had expected. From what.i have seen, monograms typically emphasize the last name so that is what I did for my husband. However, I think that whatever would make your husband happy is what mattersost. I believe the last is the most proper… Most businessmen are somewhat formal and utilize their identity by last name. Enter an answer to this question. 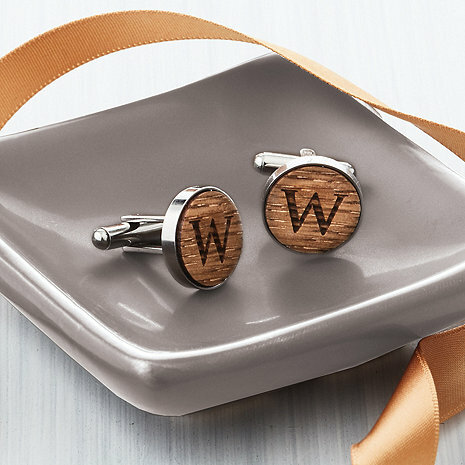 The Personalized Reclaimed Barrel Cufflinks can be engraved with the initial of either his first name or last name, it's up to you. Personally, I would use the last name initial. That's what I did for my husband. I would go with the last . Husband got these for Christmas, and he loves them! I ordered his last name initial. Hope that helps! They're awesome!! As a gift, I used the person's last name. I would go with last initial. Good luck. Great. I wear cufflinks almost every work day. I've bought some that are flimsy but not these. Very fun! The recipient of the personalized cufflinks really loved them. Upon wearing them, they were beautiful and stood out.